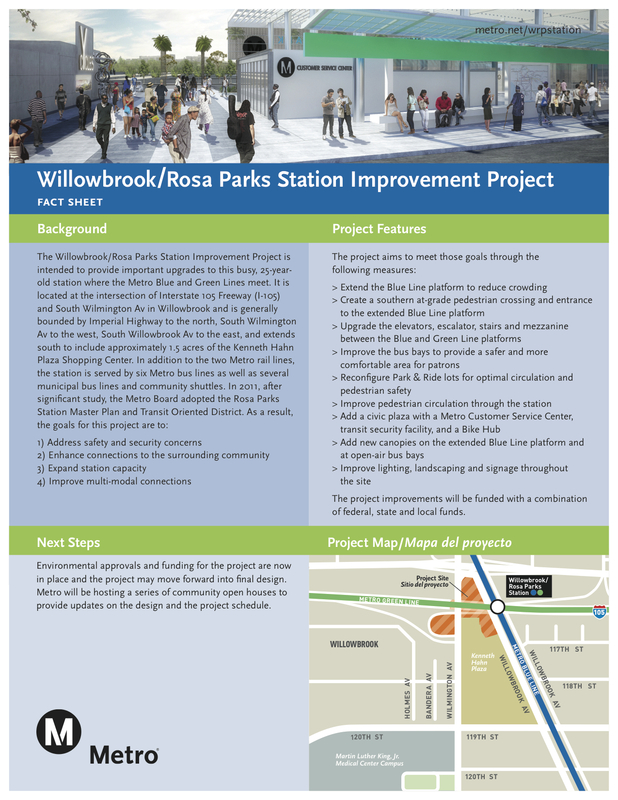 There are two upcoming meetings for the Willowbrook/Rosa Parks Station Improvement Project to help improve the busy station that also serves as the transfer point between the Blue Line and Green Line. The improved station will include: new lighting and signage; upgraded stairs, elevators and escalators; a civic plaza with a Metro customer service center; bike station; transit security facility, and; enhanced connections to the surrounding community. In the past year, Metro has been working to complete the legally-required environmental studies for the project, securing the necessary local, state and federal funding and hiring a team to complete the final design for the project. 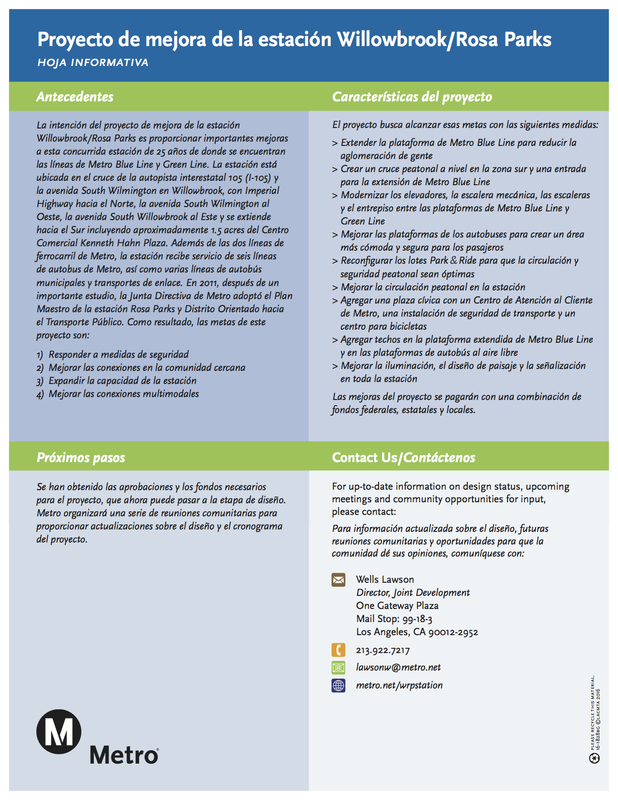 The meetings are a chance for Metro to share the latest project information with riders and stakeholders. The meetings will also include county representatives who will be available to provide updates on other projects near the station. The station will remain open throughout construction and the project will be phased in order to preserve as much convenience for Metro travelers as possible. I take the green line to the blue line often, during work hours, but frankly I can understand why many are hesitant to use the train based on this station alone. Even during daylight commuting hours, I often feel uncomfortable and have seen multiple arrests, countless people using drugs, blasting music and riding bikes aimlessly on the platform, creating a general sense of uneasiness. Many commuting patrons tend to huddle together to avoid eye contact with questionable characters. I personally don’t even bother using this station at night and instead elect uber or a tax on my return trips from downtown or long beach. It is a shame that the most vigilant police force concerns fair collection rather than providing a presence on the platforms.